And with a rumble and a roar and a laser-guided swing of Mario Mandzukic’s boot, it was all over. 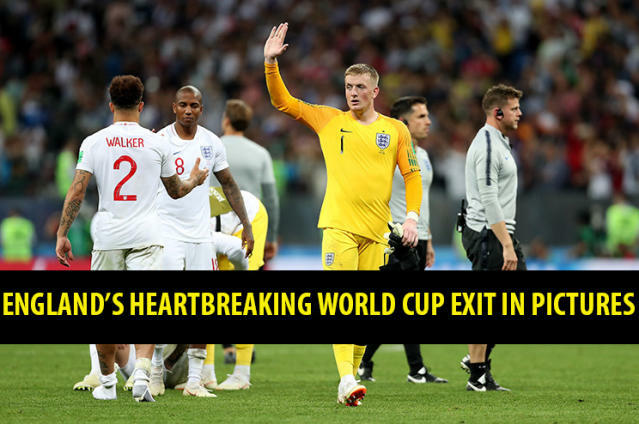 The World Cup that England had earmarked as football’s homecoming ended crouched on their haunches, their shapes denting the Luzhniki turf. Party over. Lights on. Everybody out. England are coming home, but football – alas – looks like it will be staying in the taxi and going on somewhere else. England vs Croatia in the World Cup semi-final was a game that everyone will have watched, but no two people will have seen in the same way. The gazes are too numerous, the stakes too high, the emotions too deep. Every instant was splintered into a million different interpretations the moment it occurred, like light refracting or glass shattering. Perhaps when Ivan Perisic turned the ball in for Croatia’s equaliser you saw an astonishing feat of athleticism and agility. Or perhaps you saw a clear foul for a high foot. Perhaps when Mandzukic turned in Croatia’s winning goal you saw a sumptuous flicked header, an outstanding finish under pressure. Or perhaps you simply saw the darkness stretching out in front of you, the loneliness, the desolation, the void. Four years, eight years, 52 years, who cares? In any case, it will be a long time until either England or the English are on the crest of a wave like this again, and in the meantime we’ve all got work in the morning on a raging hangover. It was – above all – an extremely weird evening, the novel and surreal sensations all bleeding into each other: the hope, the dread, the despair. That’s always been a part of football, of course, but somehow it’s never felt quite as blisteringly raw as this. After all, this is a nation who had collectively forgotten what a game this big had felt like. In time, these sensations will be repackaged and fed back to us as commemorative DVDs and end-of-year reviews and ITV4 talking heads shows: a nation’s pain mediated by a rousing soundtrack, a thespian voiceover and the wry observations of Kevin Day and Henning Wehn. But those of us who saw it will remember it like the first time. So, how was it for you? What will you remember? Maybe you didn’t remember it at all. Maybe you didn’t see it at all. Maybe you missed Kieran Trippier’s early free-kick because you were getting a round in. Maybe you couldn’t face the nailbiting finale and went out for a stroll. But from desk 74, seat B of the Luzhniki Stadium press box, it looked a lot like England had a World Cup final in the palms of their hands, and were so transfixed by it that they forgot to close their fists. Psychologists tell us that high-stress situations affect our perception. Space contracts, time seems to slow down, every moment means everything. That may be one reason why England’s passing was so much more disjointed here than it has been elsewhere in the tournament, why they so often took so long on the ball that Croatia – playing at normal speed – were simply able to take it off them. That ability to pace themselves, to modulate that ticking metronome in their minds, has been part of England’s progress to this point. They took their time before stepping up for their penalties against Colombia. They weighted their passes just enough to commit opponents. Probably, they assumed it would all work just as well here. But under the twin assaults of creeping fatigue and extreme stress, England lost their internal rhythm, and never really got it back. The fallout will doubtless be long and severe. England’s attacking blossom shrivelled to a husk in the second half, their gameplan seemingly resembling a Swiss army knife where every device was a long ball into the channel. The missed chances in the first half – by Harry Kane most notably – will haunt them for weeks, perhaps years. But in many ways, this is the point. The shadows and shapes of this game, the colours and apparitions and reverberating noises, will stay with England’s players for the rest of their lives. Where’s the point in supplementing their burden? No, let’s remember the good times. Let’s remember Trippier’s free-kick. What a hit that was! Can you imagine the sheer joy of pulling off something like that in a game of this magnitude? Can you imagine what it was like in the middle of that giant pile-on as Trippier was engulfed by delirious team-mates? Of course you can, you were probably engulfed in something similar yourself. Let’s remember Kane’s last-minute winner against Tunisia. Was that the moment you began to believe? Or was it the first half against Panama, when England did what they hadn’t done at an international tournament in at least a decade, and played like basic playground bullies? Let’s remember the penalty shoot-out against Colombia, the way they went toe-to-toe and refused to let up. Let’s remember how devastatingly enjoyable it all was to back an England team who – for once in our lives – felt like they represented the very best of us, rather than the very worst of themselves. This, after all, is what football is all about – and if you’re new to all this, welcome! The fact that football didn’t come home wasn’t as relevant as the scintillating feeling that it just might. The fact that England might not be in a position like this again for many years shouldn’t detract from the achievement of being in this position, here. The fact that pre-season training has already started, and soon the summer’s euphoria will give way to the falling leaves and familiar tribal rhythms of club football, doesn’t change the fact that for a month, these excellent young men reached into their bodies and souls, and gave us back our team. The years of hurt continue. But it was fun dreaming.